Our second Hyperacusis Research Boston-area fundraising dinner was a great success! We raised over $17,000 for research and had a broad range of attendees. Pictured at top: Bryan Pollard and Professor Rich Salvi. Before dinner, Bryan Pollard, President of Hyperacusis Research, gave the attendees a Noise and Ear IQ Test. (Take the test here). Most people found they had more to learn to improve their knowledge of noise and its impact to the auditory system. After dinner, the presentation began with a deeper dive into problems with noise. Hyperacusis sufferers aren’t the only people who struggle with our noisy world. Those with hearing loss and autism do, as well. This is an important and mostly overlooked guideline that is rarely referenced anywhere when it comes to safe noise levels. Almost all safe noise level references online refer to a different section, also described on the CDC website: “The National Institute for Occupational Safety and Health (NIOSH) and the World Health Organization (WHO) recommend that the highest permissible level of noise exposure in the workplace is an average of 85 dB over an 8 hour day. Occupational limits are set to protect workers from developing “material hearing impairment,” meaning an inability to hear and understand speech, if exposed over a 40-year period. They are not set to protect all workers, nor sensitive populations, such as children, and people with certain diseases. When setting this limit, NIOSH acknowledged that about 8% of workers could still develop a material hearing impairment.” Bryan explained that this NIOSH limit of 85dB(A) became the broad standard published virtually everywhere as the “safe” limit, yet almost always without clarification of the 8 hour duration of exposure. The 70dB standard is for the average 24-hour period and can be estimated by first taking sound measurements throughout the day with a phone meter app and then utilizing a noise-averaging tool like this one at noisemeters.com. Bryan then passed out earplugs and encouraged people to protect their precious hearing before it’s too late. By the time someone experiences signs of hearing loss, tinnitus or hyperacusis, much damage has already occurred. Jamie Banks, Executive Director of Quiet Communities, gave an overview of the effort to reduce the noise levels in our environment. Quiet Communities is focused primarily on reducing the use of noisy outdoor maintenance equipment. To give the patient perspective, Ronna shared her challenging story about the impact hyperacusis has had on her life. She developed hyperacusis after years as a dental hygienist, exposed to whining and whirring dental machinery. Ronna had to give up her job and her livelihood. Many public places are now off limits to her, including many restaurants, movie theaters and shopping locations that blast loud music. She endures constant ear discomfort. Bryan next gave a brief summary of the impact Hyperacusis Research has had in promoting research to solve the problem of hyperacusis. With a small volunteer base, Hyperacusis Research has raised nearly $120,000 in only five years. This has been used to fund four important hyperacusis projects (totaling $97,000 in grants), including the comprehensive Hyperacusis Literature review and three Emerging Research Grants in conjunction with our partner, the Hearing Health Foundation. With this seed effort, there has been a doubling of the number of publications focused on hyperacusis, as seen in the graph below summarizing all PubMed articles focused on hyperacusis. Bryan highlighted one of the most exciting trends from our seed grants — the dramatic growth in NIH grants funding hyperacusis projects at U.S. universities, which have also more than doubled in the last five years to over $1,800,000 in 2016! 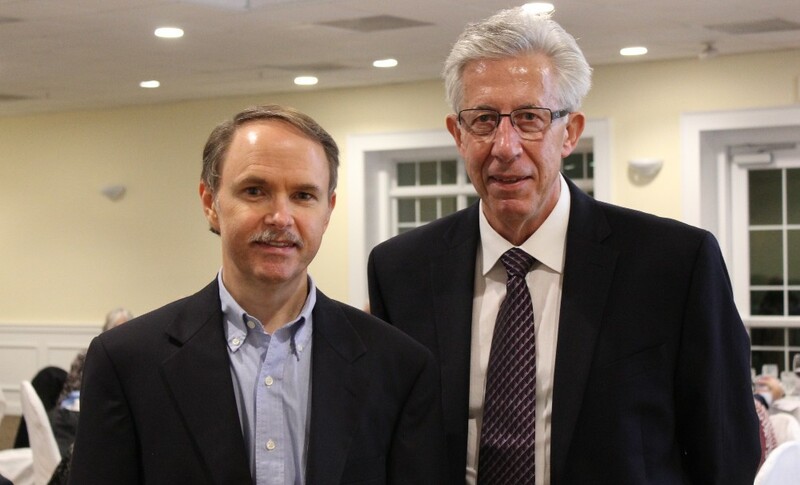 Professor Rich Salvi, one of our scientific advisors and Director of the Center for Hearing and Deafness at the University at Buffalo, concluded the event with a discussion of the fundamentals of the auditory system and a research update. His overview of the auditory system explained the basic function of the middle and inner ear. He noted that the standard audiogram tests hearing only up to 8000 Hz, which is what is required to hear human speech. But many people have hearing loss in the 8000 to 16,000 Hz range. In a study of young college men, most were found to have some hearing loss in the high range. This is important when it comes to possible mechanisms of tinnitus and hyperacusis. Without the right testing, people mistakenly believe they have no hearing loss. After reviewing the parts of the brain used to process sounds, Rich described the results of imaging tests that demonstrated hyperactivity in the auditory cortex and other brain centers for patients with hearing loss and tinnitus. In other animal experiments, he described how animals with induced hyperacusis had faster reaction times to moderate sound levels. While these animals had reduced auditory nerve output, they also demonstrated hyperactivity in the auditory cortex as well as the Inferior Colliculus, Medial Geniculate Body and Amygdala. Potential treatments could target reducing these areas of hyperactivity. Finally, he referenced an important recent paper from Buffalo titled: “Noise-induced hearing loss: Neuropathic pain via Ntrk1 signaling” by Senthilvelan Manohar, et al. In this work, the researchers searched for pain/inflammatory genes in animals exposed to very loud sounds. They found that noise exposure upregulated mRNA expression levels of four pain/inflammatory genes, Tlr2, Oprd1, Kcnq3 and Ntrk1. Pain/inflammatory gene expression changes via Ntrk1 signaling may induce neuropathic pain and microglial activation that could contribute to tinnitus, hyperacusis and ear pain. We consider these investigations of pain pathways critical to finding a cure for noise-induced pain. Pictured below are some of the attendees who have particular interests in the problem of our noisy environment, in the study of hyperacusis and how to improve the challenging lives of hyperacusis sufferers. Xiying Guan is a postdoctoral research fellow of Eaton-Peabody Laboratories at Massachusetts Eye and Ear and in the Department of Otolaryngology at Harvard Medical School. He is the recipient of our 2016 Emerging Research Grant (via our partner, the Hearing Health Foundation) which involves studying hyperacusis caused by abnormalities in auditory mechanics, or “conductive hyperacusis.” Also attending from Harvard Medical School was Heidi Nakajima, an Assistant Professor of Otolaryngology. Several audiologists attended the conference including Lisa Kaye (now retired), Brian Fligor, Chief Audiology Officer at Lantos Technologies, and Jonathon Whitton, Senior Audiologist at Decibel Therapeutics. Also attending were Dan Gauger, Senior Engineer for Noise Canceling Technology at Bose Corporation, Jamie Banks and David Sykes of Quiet Communities, and Hyperacusis Research board members Eddie DelVecchio and Michael Maholchic. A table display of posters showed stories of hyperacusis sufferers. The three posters, “Voices of Hyperacusis,” “Faces of Hyperacusis” and “News of Hyperacusis” are shown below. Research journals, books and ATA’s Tinnitus Today magazine were available to peruse. Attendees received copies of Hearing Health magazine as well as the Hyperacusis Research newsletter. We again thank our generous supporters for their help with our efforts to MAKE HYPERACUSIS HISTORY! People can still contribute by clicking the “Donate Now” button.to join our efforts to eradicate noise-induced pain. I experianced a severe concussion while in U.S. army that went untreated for four days, vomitting, weight loss etc. after 30 years I finally realized that this may be my trouble with noise, light and taste.